Notes: This distillery is a little over 2 years old now and producing even more products.The distillery located in Ovid, New York ( north of Ithaca, New York if that helps anyone) has been producing a number of excellent products over the past couple of years and now with stocks of spirits reaching maturity they are releasing more aged products such as this their Wheat Whiskey. Myers Farm Distillery is an organic farm to flask distillery that grows, harvests and distills and bottles their own organic distillates right on their own farm. You can’t get much more organic, low carbon footprint than that. Their products include their Meyer Farm Wheat Spirit White Dog, John Myer Four Grain Whiskey, Myer Farm Corn Whiskey White Dog, Myer Farm Gin, Cayuga Gold Barrel Aged Gin, and their Myer Farm Wheat Vodka. 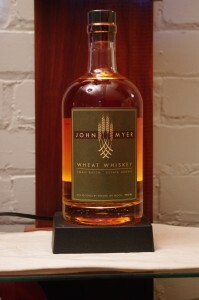 An Aged Wheat Vodka has been laid down and currently aging for sale at a later point to be determined. Established in 1868 the farm is a family farm of roughly 1000 acres that grows organic grains and 2 years ago they caught the distilling bug after selling their grain to a number of other distillers . First Impression: Wheat, tree sap, saw dust, fruit, golden raisins, with sweetness underpinning a dryish grain with slightly oily mouthfeel and finish from the wheat germ. Taste: Delicious with apples, sap wood, oak char, ashes, A bit young tasting with some rough edges but overall a nice roundness to it that many other wheat whiskies lack. Drinks:Think of this wheat whiskey as drier ( less sweet) than a bourbon, but milder than the sweet sour spice of a rye , with good grain, wood and char notes. A little like a highland scotch without the peat, or maybe a drier leaner version of an I wish whiskey and you start to get the mixing possibilities here. Makes a very dry almost ascetic Dry Manhattan, works nicely for a minimalist version of an Old Fashioned or whiskey sour. It is an outstanding way to introduce the fear of flavor vodka crowd to brown spirits and real cocktails ! Bottle: Heavy clear bell or apothecary shaped bottle with heavy decanter bottom. Simple but tasteful graphics on a dark green colored paper label ( in this case it has a graphic of wheat stalks and heads) and a black synthetic cork with a nicely ridged top make it easy to open. Overall a nicely done if not overly distinctive package. Final Thoughts: A very well done wheat whiskey ( frankly I find a number of wheat whiskies fairly awful, hot, and undrinkable and too expensive. This is a wonderful exception to the rule. Website has some information as to the farm and history, product list ( with great tasting notes), list of where to find/buy but could be more informative. There is also a link to their Facebook page which contains much more current information and updates.